Most homeowners preparing to put their homes on the market don’t know exactly what to look for when hiring an agent. As a home seller, you’re about to place what may very likely be your most important financial asset into your real estate agent’s hands, so remember: you can treat your agent like any professional applying for a job. Interview him, take time with your decision, and make sure you’re comfortable with it before signing anything! Trust is by far the most important element of any relationship, and yours with your REALTOR® is no exception. Before partnering with a real estate professional, get to know him, his experience, and how he’s going to guide you through the process of selling your home. Ask these questions, and any others you have, before hiring an agent. See Brett’s answers below! How long have you been marketing real estate? Brett: I’ve been an active full-time Realtor since 1986. I’ve brokered many more transactions than the average agent, and I am proud to say that I’ve represented seven times more home sellers than other agents. How do I know you’re an expert in the home sale process? Brett: In the last year, I was involved with more than 92 home sales; the average agent sells just seven homes a year. I have also been published in national real estate trade journals, The Philadelphia Inquirer, Main Line Media News, on ChiefMarketer.com, and in the RE/MAX Times newspaper, which has a distribution of over 90,000 agents. I have also spoken at national conventions addressing groups of 500 real estate agents about how to utilize technology, and I’ve given guest lectures at Temple University for the course “Social Media for Real Estate Professionals.” You could say I literally “wrote the book” on real estate, having recently authored What You Really Need to Know about Selling Your House. Can you provide me with some statistics on your success with home selling? Brett: The properties listed with me average only 69 days on the market as compared to other real estate agents, who average 94 days on the market according to the Trend Multiple Listing Service. Additionally, my average sale price to list price ratio is 95% compared to all other agents in the local multiple listing service at 90%. This means that homes listed with me sell more quickly, and for a higher dollar amount than those listed with other agents. Do you have references? What do your clients say about your service? Brett: I have dozens of professional references to share, though the highest and most important praise for any REALTOR® should come from his clients. I’m very proud to have earned the Super Service Award from Angie’s List from outstanding client feedback. Many very kind and positive testimonials and reviews about my work can be found there, and on other similar websites. I can also connect you with former clients for more personal conversation about my services. Why is it important for an agent to have a broker’s license? How would that benefit me as a client? Brett: A broker’s license requires advanced coursework and extra real estate experience, which is a benefit to any client. My broker’s license also means that I own my own office, allowing me to continually gain more and different experiences in real estate than agents from other companies. Do you know much about the market in my area? Brett: My knowledge of the Philadelphia area is both personal and professional. I’ve lived and worked here all my life, and this has given me a thorough familiarity with this region from the perspective of a resident, as well as of an agent marketing and purchasing real estate. How do you help determine the value of a home? 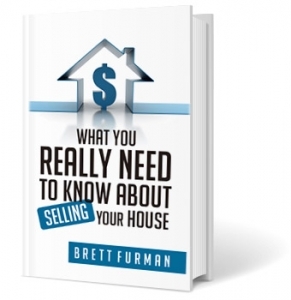 Brett: Many sellers go to real estate websites like Zillow to try to determine the market values of their homes. Zillow’s calculating process is based on algorithms rather than the live conditions that influence property value enough that the fine print of Zillow confesses that their home values could be inaccurate by as much as 20%. When you work with me, my 30+ years of analytical experience are put to work for you. I use what I call the Smart Seller Price Absorption Analysis, which guides the pricing to deliver 95% of list price, whereas other brokers only average 90%. On a $400,000 home, that extra 5% means getting an additional $20,000 for your home. My Absorption Analysis can also help to pinpoint the best time to put your home on the market. What methods do you use to market a home? Brett: I employ every modern method to market a property, for maximum possible exposure in every marketplace. First, I use direct mail before your home even hits the market. This creates interest and generates phone calls in advance. Once your home is listed, it will be marketed, not only in the Multiple Listing Service, but in social media and on real estate websites like Zillow, Trulia, and Realtor.com, with expertly written copy, well-chosen photographs, and a virtual tour, all created by my Marketing and Creative Coordinator. How will you help prepare my home to go on the market? Brett: I recommend a pre-sale home inspection, then a pre-sale appraisal once the inspection, and any necessary repairs, are complete. Many sellers shy away from the idea of a pre-sale inspection, fearing the exposure of problems hidden within their walls, and then incurring too much cost for their repair. Yet years of experience utilizing this method with my clients has proved the opposite to be true. Uncovering potential problems in a pre-sale inspection gives control to the seller, and eliminates surprises, negotiations, and buyers backing out of a contract using an inspection contingency clause. In the end, sellers save time, money, and a lot of aggravation by inspecting first, then using a pre-sale appraisal to further guide the price determination. What happens if my home inspection turns up the need for repairs? Brett: First, we’ll decide together which repairs are most important to help achieve the quick and easy sale of your home. Next, we’ll use what I call my Home Seller Concierge Service. This complimentary service allows me to personally match my clients with the skilled and experienced vendors appropriate to their needs, including but not limited to painters, contractors, plumbers, electricians, landscapers, handymen, and movers. However, you are not obligated to use this service, and can use any vendors of your own choosing. If I sign a listing contract with you, am I locked into it? Brett: I provide my clients with what I call my “Easy Exit Clause.” This means that, with two weeks advance written notice, you will be released from your contract unless we are in the midst of active negotiations or pending sales. If I sign a listing contract with you, how long will it be until my home will be actively listed for sale? Brett: After the pre-sale home inspection and appraisal and any repairs are completed, we’ll talk about sprucing up your home’s interior and exterior for photography and showings. If staging is necessary, we’ll create a staging plan. Next, my creative team will photograph the home and create the copy and virtual tour that will accompany the listing in the Multiple Listing Service, social media, and real estate websites. This means your house is now ready to list! Once my home is listed, how will showings work? Brett: My company works with a specialized appointment desk for real estate showings called ShowingTime. Our appointment center can confirm showings via telephone calls, text, email or voice messages. This method allows me to schedule and confirm showings more quickly and easily than with the traditional showing systems of other real estate offices. Once all of your questions are answered, look for reviews and testimonials online call references, and ABOVE ALL ELSE, follow your instincts!